FlossieBlossoms: It can happen in an instant! One minute you're minding your own business and the next- BANG! You're a victim of a drive-by! 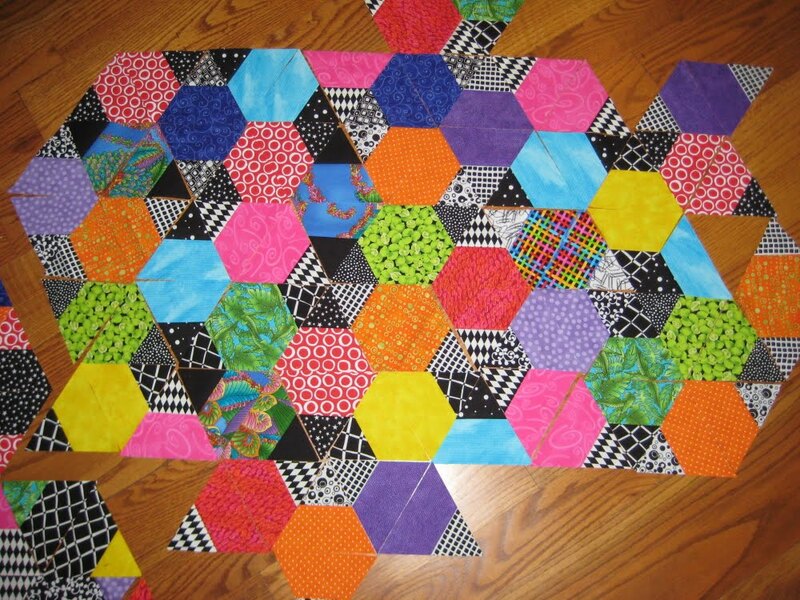 I'm working a new quilt, or what may become 2 quilts- hexagons. This is another quilt-along over at Flickr, at the Old Red Barn Company group. This one is being taught by Julie at jaybird quilts. I decided to do a stash-busting one using fabrics I had on hand, so I thought a black/white with brights sounded good and summery. 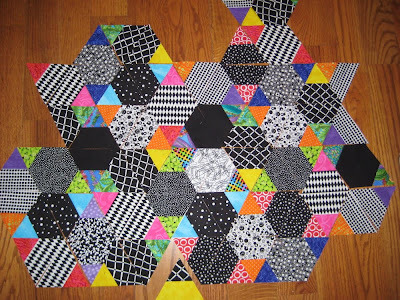 ......and another like this one, mostly brights with little bits of black/white. 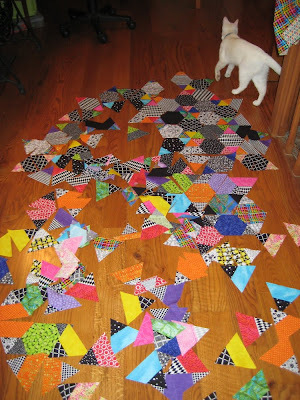 I was having a great time making up more triangles and working them into each layout, when suddenly- the beast came from out of nowhere and plundered the layouts. Ack! Then she came back to admire her handiwork. It was exhausting work, too. A nap on the fabric hutch (where all good things come from) was in order. Oh, a life of crime- it'll flat wear a girl out! *in sappy voice* Where's my girl? Where's my girl?! There she is! My clever wee girl!! Who's a cutie? WHO is a cutie?!? You are! Yes, you!!! *scratches under Parker's chin* Not you, Floss, the cat! I am totally feelin' that black and white affair, BTW. I KNOW you love the bright - and it's a pretty one, too - but the b&w with a splash is smokin'!! P.S. My WV is gardi! 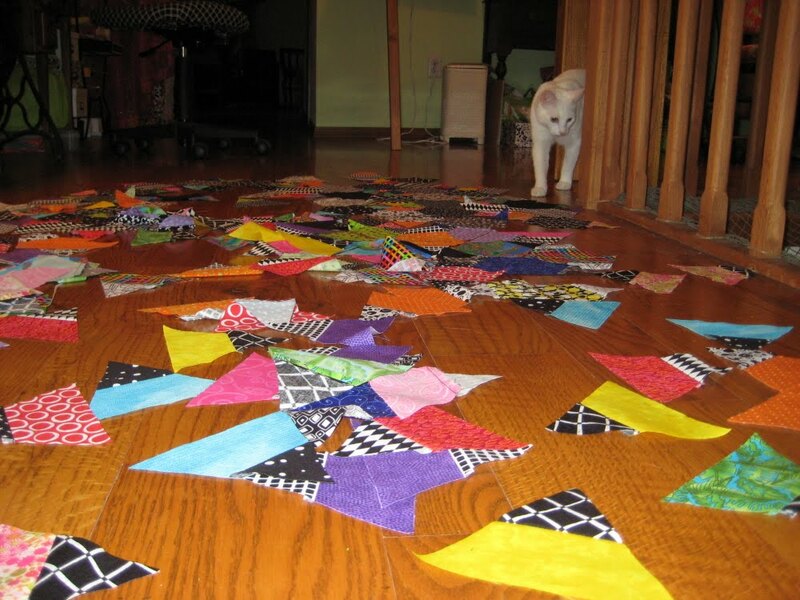 You need to gardi your floors better!! Millie loves to do this. I call it The Slip and Slide Game. Our little dog likes to lay on quilts I am tring to pin baste on the floor - nearly always picks the spot to lay down where I need to put the next pin. The layouts look great, I especially like the black and white with spots of color! Yep, can't turn your back for an instant! They're sneaky little devils :-). I love your project! The colors are really wonderful. Oh man! That last shot is priceless!! I am loving your hexie quilt. And I look forward to seeing what final arrangement you decide on! Oh my gosh! I almost lost my coffee all over my computer screen!! Don't you just love that little NP? Too funny. 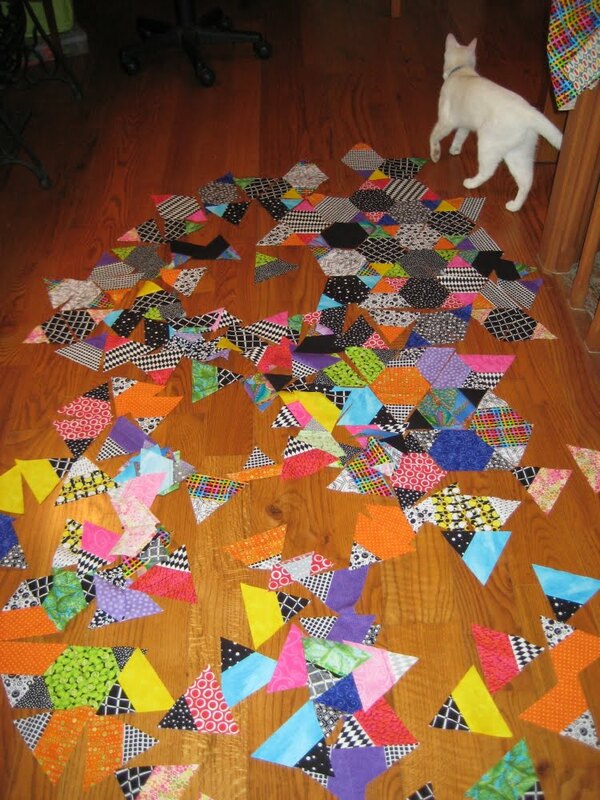 It looks like she wants to be a quilt designer too. What great pictures. One more reason I will never have a cat. Well, that and my allergies!! Looks like she had a ball there, the little minx. Both those layouts will look amazing. 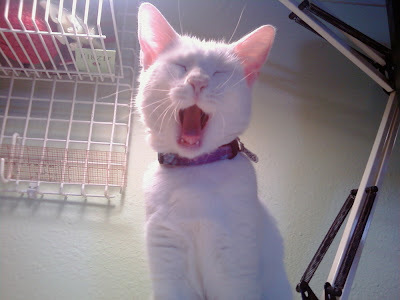 The yawn photo - too much!!! Hi we comes over from Millie's. 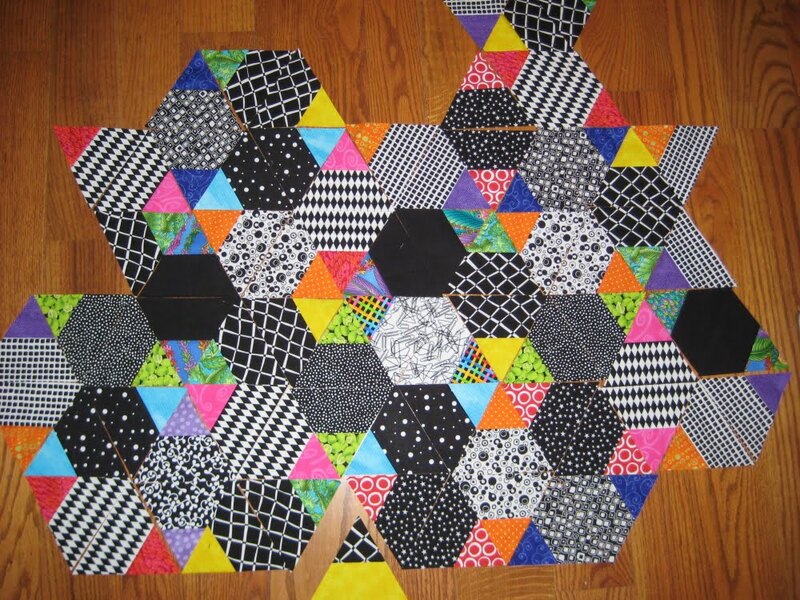 This is great work, both the quilts (we likes the B&W with a splash best too.) and the Parker redesign. Now I not wants to get Parker in trouble, but she looks a little like she's laffing in that last picshur. LOL Flossie! are you sure she was yawning and not laughing?!!! !